of sowing seeds, preparing ground, watering and tending, labelling, tieing in, cutting back and pinching out..
Lots of waiting of around wondering when will things get going. Managing the pests, weeding and feeding. Of noticing details and minutiae, of puzzling and wondering, of working things out. Of sitting back and enjoying the fruits of your labour. 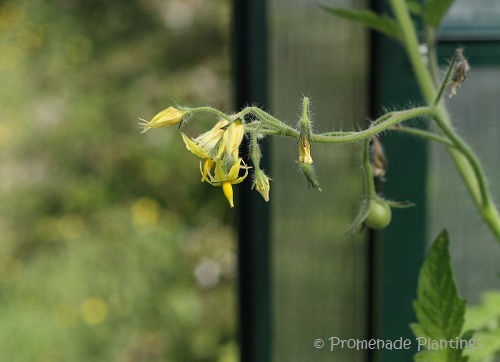 It seems this year I will have to rely on my greenhouse grown tomatoes as Blight has hit – this is the disease that was behind much of the Irish potato famines; without wishing to sound glib, thankfully I’m not relying on my crops to feed my family, but it’s still so disappointing to have to grub up and destroy plants. So the gardening rhythm has hit a discordant note and jarrs with the normal rhythms, and I have to adjust and re-tune. However you post, be it in words or photos, I love to read them. I’ve been out of commission with visiting friends these past few weeks, and I’ve missed reading about your adventures! Your tomatoes look wonderful! Perhaps an Indian summer or a long mild autumn will help your rhythm return… gardeners are by nature optimists! Those tomatoes look very pretty AND delicious! thank you, I find I’m more and more fascinated by the stages and steps from seed, to seedling, and flowers emerging. I find it inspiring to watch ! Beautiful words and pictures, Claire! I’m so sorry about the blight on your tomatoes. After all your hard work! Is it the dampness this year that has caused it, or something in the earth, or both? Good for you, for following the rhythms that feel right to you! Hi Cindy, it’s a mixture of the dampness in the air and sheer bloody luck! 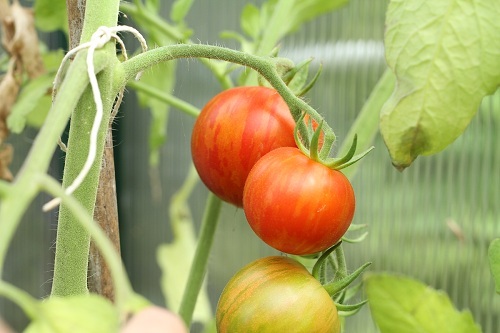 I’ve managed to avoid blght in previous years when growing outdoor tomatoes in the garden, it’s rife on our allotments as the wind spreads it so easily. But high-ho it’s off to work we go, and I do have the ones in the greenhouse to delight in ! It has been such a damp year, I suppose the blight attack isn’t that unexpected. Painful though to dig up and burn what should be feeding you. And I can’t compost the remains either. It’s burn or take them to the dump for them to deal with! Love all the tomato photos. T is for tomato, at least during the summer. Boo for blight. It could be D is for delectable-delightful tomatoes! And B is definitely Boo for Blight!! “noticing details and minutiae” is what make the difference between a good garden and a great one, and yours is one of the greats! Thank you but I seriously doubt my being great, but I do love it and I love sharing !! There is always so much to learn and try. and I know you feel my pain, it’s a vile disease, to sit and see the tomatoes rotting on the vine is miserable, but as I say I’m fortunate that my living doesn’t rely on them, farmers must dread it! You know I was thinking about this a bit more and my words “noticing details and minutiae” and how slow on the uptake I am at times. I’ve been sitting on the back doorstep for the last few days thinking, something isn’t quite right with that tomato plant, they seem small, and don’t seem to be ripening. It was only when I eventually took a closer look in the daylight I realised I’d been sitting looking at the blight! Live and learn eh?! I’m trying to focus on the few that I have that are still alive and healthy, and savour them that bit more John. Nothing like the taste of summer tomatoes, which reminds me I nee dto check on the basil! This time of the year, let the photos do the talking…your hands are busy elsewhere! Sorry to hear about the blight! Three years ago we had a a very cool rainy summer and there was a terrible outbreak of blight which destroyed most of the tomato crop in the Northeastern US. Gardeners and farmers around here were traumatized and everyone still talks about it. Lately I’ve heard reports of blight appearing around here in the past few weeks. I’m keeping my fingers crossed, hoping it doesn’t turn up in the community garden. I can understand how that would affect people – to lose most of a crop in a region, I shudder to think of how the farmers coped, and whether people lost their livelihoods. My fingers are firmly crossed for you Kate, I know you can spray, but I avoid that like the plague. I guess it’s the decisions we take and how comfortable we are with them….. Thanks, Claire! I know a lot of the farmers around here have reluctantly begun to spray their tomato plants with copper fungicide. It is technically considered organic, but better not to have to spray at all. Losing the entire tomato crop would be devastating for them, so I can’t say I blame them. 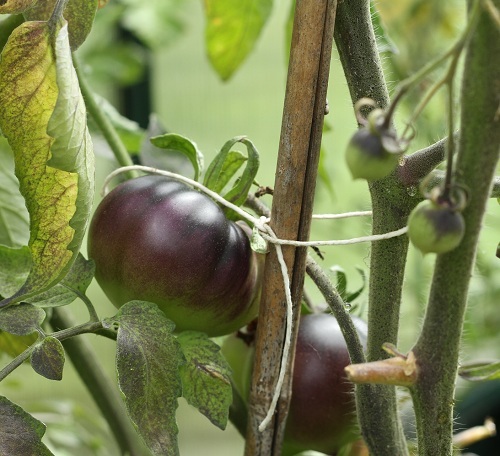 I forgot to ask, what is the name of that beautiful deep purple tomato? I’ve never seen one quite like it. Gorgeous color! It’s a shame to have to spray, the copper one is available here, but so far I’ve resisted! Ah great minds think alike when it comes to Blue OSU 🙂 And thanks for the encouragement, I can’t tell you how appreciated it is ! That tomato is a beauty! THE RYTHYM OF THE FALLING RAIN! Thank you ! I think I’m lucky with where I chose to live – we don’t get as many rainy or cloudy days as many parts of the country, mind you having grown up in Manchester and worked in Glasgow, anywhere is drier !! 😉 Hope the sun comes out this weekend for you! Your tomatoes look lovely, pity about the other ones. Thank you Glenda, I guess I have to appreciate what I have and stop thinking about what I’ve lost! Sorry about the blight. We lost all our tomatoes to it last year, but this year I’m still crossing my fingers! Your greenhouse toms look great. 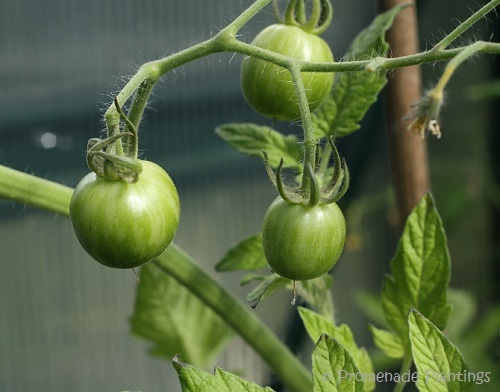 Watching the growth and development of a tomato from the flower to the ripe fruit is a joy and makes us appreciate the bounties that nature has gifted us with. So much more than just going to the grocery store and picking up that sterile wrapped package of perfectly sized cookie cutter tomatoes we can get these days. Love the color of the tomato, though! It’s a beauty isn’t it Yummy, and thanks ! How nice .. that you are using the same theme as .. me. 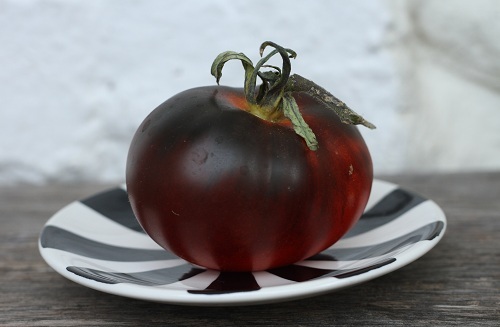 First time visit somebody with “Forever” – today I have seen picture of “black tomatoes” twice .. never seen them before. They are truly beautiful. Stunning photos !!! You know I only change dthe theme yesterday, I was mucking about and fancied a change, I’m still trying to get used to it ! It’s a great theme .. and if you need any help let me know .. took me months to get the photos where I wanted them. I like the sound of your studies, well to be honest I like the sound of spending time in a greenhouse as part of studying 🙂 and hi and thank you, the Blue tomato is a bit of fun isn’t it ! Beautiful post! The eggplant photo is stunning! You are full of creativity! Thank you, I need to get into the greenhouse and check some of the labels, as of course I’ve now forgotten what else I’m growing !! Thank you Nia, and I hope you are havin a great weekend too ! Claire, I’m sorry about the blight. I don’t grow anything, besides some herbs. But I can imagine your chagrin. Beautiful color though, There are also various color vegetables in my garden. Some are very strange. Now I’m curious to know what you are growing !! I look at my little garden every day with great expectation, and there are always changes. Sometimes the change is so small it would go unnoticed if I weren“t such a hovering mom. The rhythm is its own and sometimes slower than I’d like. “a hovering mom” sums it up so nicely, we all sit and watch and wait and maybe fret a little don’t we ! Well, even with blight, your tomatoes did better than mine. I have two about the size of the little one in the first photo. I love the colors of your tomatoes. Do you ever pickle green ones–they were my favorite as a child, and I can’t get the recipe right because it was in my mamas head. Hi Alice, in previous years, when we’ve had REALLY poor summers I’ve made a green tomato chutney, so not strictly a pickle. I think my favourite is fried green tomatoes but they do need to bigger don’t they ! I wonder what your mama put in the pickle that made it so special ? Nature’s rhythms have a natural ebb and flow, a waxing and waning and always cycle back to be renewed. Your rhythms mirror the bigger picture…. Wow ! that purple tomato is amazing. Photo should be in a cookbook. I am sorry to hear about the blight. It has been a tough year for many farmers. or exquisite gardeners like yourself! Oh BAM how kind of you! I keep thinking, I’m not a farmer nor am I relying on my crop to feed us, I shudder to think how they cope! I hear some parts of the States are really struggling this year. Wonderful ! I have firends all over the world ! And it’s funny when one of you pops into my head, I regularly think of you when I practice the (now I do get names mixed up) the Lotus hand and breathing exercise and wonder if you are practicing/teaching or maybe walking along the beach ! The sage garden sounds delightful, I saw a beautiful Texan Hummingbird Sage the othe rday on a fellow bloggers site – a vivid scarlet, so illuminating. It’s such a shame I can’t send seeds to Aus, such a no-no !!! You may feel out of rhythm but your garden photos have such a serenity–who could ask for anything more? Sorry about your tomatoes, they look just stunning in the photos – and, to be cliché, a picture can be worth a thousand words! Everyone seems to be having gardening woes at the moment – I blame this horrendous wet weather. Beautiful photos Claire–and post. I too have lost a bit of garden lust! The heat has taken a toll, on me and the garden. Oh Stacy I’m not surpirsed with the heat you guys have, it must be energy zapping! Dare I say it, but autumn in on it’s way…….